During its first one hundred days, the Trump Administration made this much clear: Big Oil’s agenda is at the center of their energy and environmental proposals. So where can we turn for hope and sanity? It turns out that the antidote is likely in our backyard here in New England. In the face of these proposed clean air and climate rollbacks at the national level, states like Connecticut, Massachusetts and Rhode Island are emerging as champs in new efforts to fight carbon pollution locally. In each state legislature, elected officials are pushing a variety of clean energy advances to show what new climate leadership looks like. In particular, each state is proposing innovative carbon pricing policies that would reduce pollution, keep our energy dollars local and invested in the regional clean energy economy through a fee and rebate approach. The fee would be paid by out-of-region fossil fuel companies and then get passed along to state residents and businesses as an incentive to support local clean energy options. A new report from the Harvard School of Public Health shines the light on the health co-benefits of carbon pricing. This new study found that carbon pricing in Massachusetts alone would result in nearly $3 billion in cumulative health benefits, with reductions in hospitalizations and deaths from respiratory and cardiovascular disease and other health improvements. Over the life of the carbon pricing bill in Massachusetts, 340 lives would be saved from cleaner air and the reduced emissions of microscopic soot, smog and other hazardous air pollutants. Additional health benefits would include reductions of respiratory and cardiac hospitalizations as well as heart attacks avoided. With this new understanding of the health benefits of carbon pricing playing out regionally, see below for carbon pricing campaign updates from YOUR home state. Regional and state leadership are well understood in Connecticut, a leader in the Regional Greenhouse Gas Initiative as well as in grassroots energy planning. This year, carbon pricing became a next focal point with the March public hearing on Bill 8247 before the joint Senate and House Committee on Environment. A press conference brought together sponsoring Representative Jonathan Steinberg (D-Westport) and Sen. Ted Kennedy (D-Branford) with grassroots advocates and supportive legislators from other states backing this effort throughout New England. Hearing testimony reflected broad support from environmental, religious and business leaders such as the national energy company NRG. Testimony about the bill’s clear economic benefits — its ability to drive innovation and to create a fair playing field for all types of energy supply — dominated much of the discussion during the initial 6+ hour hearing. In a season of bruising budget battling, this bill was introduced to provide a genuine solution, a policy that manages climate costs and risks while creating economic advantage for the energy companies with the best environmental performance. Although it did not pass this first session, it did enliven the debate about serious approaches to reducing the carbon pollution driving the climate crisis and has successfully built a head of steam for next year’s re-introduction. Spurred on by growing momentum around carbon pricing throughout Massachusetts, two major bills were introduced this session with initial support from over 40% of the legislature. 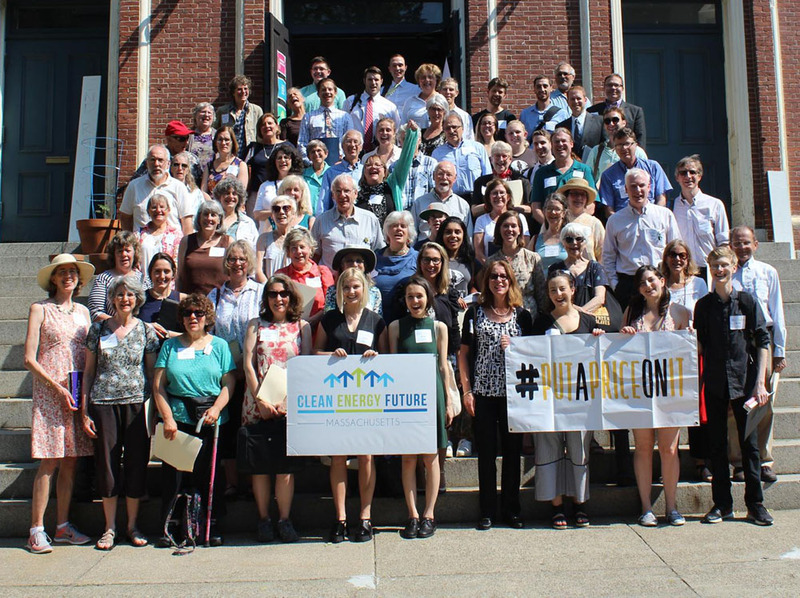 Clean Water Action and allies within the Massachusetts Campaign for a Clean Energy Future, support both bills as key tools in the effort to keep Massachusetts on track to meetings its climate mandates recently upheld by the state’s Supreme Judicial Court. Senator Mike Barrett introduced SD.1021, “An Act combating climate change,” that would establish a fee-and-rebate style carbon pricing system. Representative Jennifer Benson introduced HD.1504, “An Act to promote green infrastructure, reduce greenhouse gas emissions, and create jobs.” The bills are very similar, although Rep. Benson’s bill would also reinvest 20% of the carbon fee revenue in community level green infrastructure projects (such as public transit, energy efficiency and renewable energy projects). Public hearings are expected within the coming weeks and will highlight the broad support for both policies. The Energize Rhode Island Act continues to move forward in the General Assembly this session. The Senate Environment and House Finance Committees have held public hearings already and a next hearing is planned in the Senate Finance Committee shortly. The addition of trigger language requiring a neighboring state to pass similar legislation before the Rhode Island bill takes effect has eased concerns about the effect on our small state’s economy if we tried to go it alone on carbon pricing. The Energize Rhode Island Coalition also supports separate legislation that would require the state’s formal climate change council to study the effect of carbon pricing on state health and the economy. Key state officials including Governor Raimondo have said they would consider carbon pricing solutions as long there is a regional strategy. To meet this concern, active coordination of legislators in Connecticut, Massachusetts, Vermont and New York is ongoing to ensure regional synergy. We are also organizing at the community level with canvassers from the Working Families coalition and Clean Water Action, rallying voters at their doorsteps and writing to their legislators in support of our bill. So don’t be surprised to get a knock on your door this summer with news about how YOU can get involved! A recent academic study found that individual pieces of plastic will outnumber fish in the world’s oceans by 2050 if we continue to produce and improperly dispose of plastic consumer goods at our current rate. The majority of plastic that enters our oceans comes from single-use products: beverage bottles, plastic bags, polystyrene items, and cigarette butts. When close to shore, these items enter rivers and streams, washing up on shorelines and beaches. As they make their way out in to the open ocean, however, the break in to smaller and smaller pieces — called microplastics — through a combination of waves and sunlight. As they break down, they act as chemical “sponges,” absorbing and concentrating pollutants in the water. Fish, shellfish, and sea birds then often eat them, mistaking them for food. The concentrated pollutants are absorbed into fatty tissue, entering the food chain, and when enough plastic is consumed, the animals die because sea life cannot digest plastic. Most solutions for this problem involve either volunteer cleanups or technologies for collecting plastics once they make their way in to the water — skimmers, trash wheels, vacuums, ocean surface-sweeping booms, etc. But these are end-of-pipe solutions. They don’t actually solve the problem. Instead, the focus needs to be on source reduction strategies that prevent plastic pollution from ever happening in the first place. Here in Rhode Island, Clean Water Action is actively working to reduce plastic at its source through a combination of outreach, education, and public policy. Along with nonprofit and government partners, Clean Water is in the process of developing a comprehensive, innovative waste and litter ordinance for the City of Providence. The most important aspect of this work is our engagement with community members to identify specific waste-related problems they might have as well as potential policy prescriptions. These interactions will also allow us to educate Providence residents about individual choices they can make as consumers to reduce the impact of plastic on the environment. A bit farther north, Clean Water is hard at work in Central Falls to develop a resident-sourced community greening plan for the neighborhood around the city’s high school. Throughout the spring, staff have been working with a group of 30 high school students to identify neighborhood concerns and start to identify ways to address these concerns. Once the school year has ended, several of these students will spend part of the summer speaking with their neighbors about the project, enlisting them to collaborate on the greening plan. Part of this plan will include ways to reduce the amount of litter found in neighborhood streets, yards, and open spaces. Finally, we will be spending an entire week in July out on Narragansett Bay trawling for trash to find out just how prevalent microplastic pollution is in our own state. For five days, we will visit different corners of the bay, sampling as we go to identify the type and quantity of plastic pollution and marine debris in our coastal waters. In doing so, we hope to raise public awareness of plastic pollution and show that it doesn’t just happen in garbage patches in the middle of the ocean, but right here in our own backyard. All three projects will highlight not just the problems that are presented by plastic pollution, but the potential solutions we can enact to stop it right at its source. What’s with the BPA in the Cans? Bisphenol A, often called BPA, is widely used despite hundreds of scientific studies linking it to significant health concerns — diabetes, obesity, heart disease, and cancer. A new report, “Kicking the Can? Major retailers still selling canned food with BPA,” co-released by Clean Water Action on May 17 shows that millions of Americans are exposed to BPA when they eat canned foods. For Kicking the Can, cans were purchased from eleven states, primarily from four national retailers: Kroger, Albertsons/Safeway/Shaw’s, Dollar Tree and 99 Cents Only. In Massachusetts, a group of teens from Medfield Green participated by choosing and purchasing cans to be tested from their local Shaw’s. The two largest grocery chains in the country, Kroger and Albertsons, continue to sell canned food lined with toxic BPA. 36% of Albertsons’, and 33% of Kroger’s “private label” food cans tested positive for this harmful chemical. 19% of the cans tested use linings containing PVC, a toxic substitute. While this is alarming, there are actions everyone can take to reduce exposure to BPA. Adopt a written public safer chemicals policy with public quantifiable goals with clear timelines for reducing and eliminating chemicals of high concern in products and packaging. When purchasing canned food, ask your store about BPA-free canned foods. Let’s work together to eliminate these health risks and make shopping straightforward! We shouldn’t have to worry about the products we buy, but instead should be able to grab food off of the shelf and trust that its packaging will do no harm. Clean Water’s Energy and Sustainability program in Connecticut continues to be grassroots-based, operating at two levels. It supports local clean energy initiatives taken by some of the most innovative cities and towns in the state. And at the Capitol — in yet another painful budget season — Clean Water pushed hard to prevent the loss of the very policy supports that make those efforts work. Over sixty local governments have appointed Clean Energy Task Forces to engage households and businesses in energy improvements as well as guiding local energy planning. In the program’s fourth year assisting these efforts, staff are focusing on helping the Task Forces integrate sustainable energy strategies into the local Plans of Conservation and Development, with special attention to the deep penetration of renewables into the local system and resiliency under stress. Clean Water is excited to be working with partners in West Hartford, Simsbury, Westport, Middletown, Wilton, Madison and other communities where strategies are being figured out and shared. This is made possible by a unique group of funders: the Tremaine and Hampshire Foundations and the Common Sense Fund, who not only fund programs but network among them and bring best practices to the attention of practitioners. It has been tougher going on the other side of our program, coordinating statewide efforts among environmental groups and local advocates to advance clean energy policy. With support from the Barr Foundation, Clean Water has been following the progress of co-op style “shared solar” which has shifted from a small pilot to a smaller pilot due to mid-stream shifts in the state’s program criteria. In this most recent legislative session, Clean Water elevated the concerns of municipalities to the Capitol. S.B.106, a bill to let the state’s main nuclear contractor, Dominion, bid into a special auction that may compete with renewable energy, has been drawing most of the oxygen out of the legislative debate. The political energy that remains has been taken up in preventing a raid on the funds that support clean energy programs — the Energy Efficiency Fund and Regional Greenhouse Gas Initiative — to fill gaps in the general budget. Clean Water Action wrapped up the legislative session with determination to fight these developments and #REBOOT FOR RENEWABLES in an omnibus energy bill that still could come to life. the federal level and in Connecticut to urge passage of initiatives that rapidly get us to 100% renewable energy” stated Hulick. It is easy to think of Connecticut as water rich with abundant sources that supply drinking water for the 3.5 million residents of the state and support recreation, fishing, boating and wildlife habitat. Connecticut enjoys the nation’s highest standards for drinking water and have ecologically sensitive laws that protect stream flow and wetlands. Yet, the state’s waters are under threat from a changing climate, polluted runoff, efforts to repeal a successful bottle deposit law that allows residents to get a five-cent redemption for returning plastic bottles and cans and now, Niagara, a large water bottling company, is setting up shop in Bloomfield and paving the way for others to do the same. Clean Water Action has been fighting alongside residents in Bloomfield to pass legislation that will 1) put restrictions into place that will prevent large water bottling companies from gaining rights to our water without any state oversight, environmental review or restrictions during times of drought. The field and phone canvass team has generated hundreds of calls and letters to state legislators and Governor Malloy and we’re making a difference. After a period where nothing seemed to be moving forward in CT’s General Assembly, there is now broader support for a bill that will accomplish these goals. Thanks to Clean Water members, the canvass team and all that are working to protect our state’s waters! Polluted Runoff: Rain and snowmelt that flows over impervious surfaces such as parking lots, roads and buildings picks up many toxic chemicals from tires, oil and gas, pesticides, salts and other snow treatment chemicals. This polluted water flows into storm drains and directly into our rivers and streams. We are planning to work with communities across the state to support green infrastructure, rain gardens and other measures to reduce this significant source of water pollution. Over-allocations of water: As a result of an outdated system for allocating water, the amount of water that can be legally pumped out of rivers and streams often exceeds their total flow! It should not be legal to pump a stream dry and we are working right now, along with other environmental advocates, to update regulations that prevent this from happening. Corporatization and sale of our water: Niagara, a California water bottling company gained rights from the Bloomfield town council and the Metropolitan District Commission to withdraw up to 1.8 million gallons of water per day out of the Farmington River Watershed for sale, with no environmental review, no restrictions during times of drought and Niagara received millions of dollars in tax abatements! Clean Water Action has been fighting to pass state legislation that closes these legal loopholes, requires an environmental permit, restrictions during drought and fair and equitable rates for water bottlers. Climate change: The world is already experiencing effects of climate change including devastating storms like super storm Sandy, unpredictable weather patterns that affect stream flow, warmer temperatures that affect streams, rivers and fish and we continue to experience a statewide drought! It’s time to re-think how we use and protect clean water. Clean Water Action is launching a campaign across the state to expand water conservation and actions that will mitigate the climate change impacts to the state’s waters.